The Fellowship was fortunate enough to obtain a copy of DRACULA WORLD ORDER. The story is by Ian Brill with art by Tonci Zonjic, Rahsan Ekedal, Declan Shalvey, and Gabriel Hardman. Count Dracula wants to take control of the world where the top 1% of the population are vampires, the rest are food, slaves, or worse. The only thing that stands in his way is the team that is being put together by Prince Alexandru…Dracula’s son. We see the formation of his team that consists of Vincent MacReady, a vampire hunter, and Pham Phuong Mai, a young woman who is a test subject for Dr. Galvini. They are in the process for recruiting a new member…when FATHER shows up. This is a good solid story from Mr. Brill. While a little of Alexandru’s past is told, MacReady and Mai’s lives before joining Alexandru are a mystery. I hope that the future books will address this. I also hope that Brill will reveal why Alexandru is rebelling against his father. The chapter showing his childhood does show one possibility. There is potential here for a real good ongoing or several mini-series. The beautiful artwork is used to a great effect that not only distinguishes the different chapters, but also gives a unique vibe for each member of Alexandru’s team that the chapter focuses on. This is definitely worth checking out. 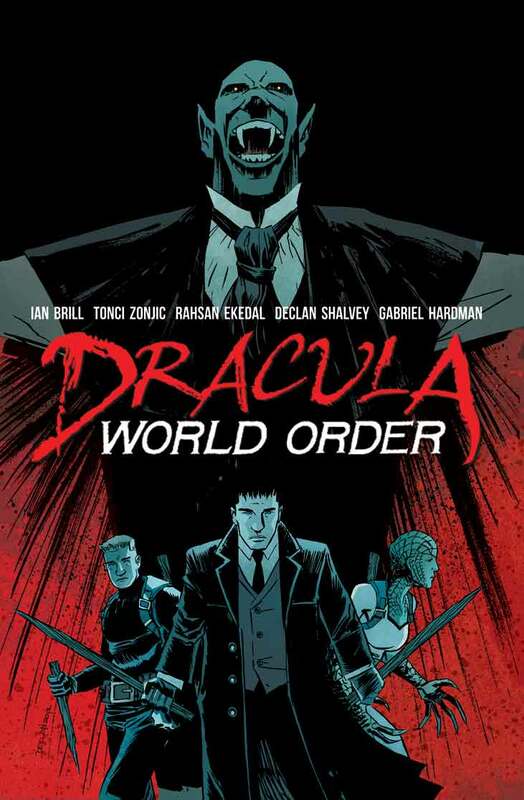 DRACULA WORLD ORDER is available at www.comixology.com and www.tfaw.com. You can find a list of select retail stores that have the comic at draculaworldorder.tumblr.com/retailers.